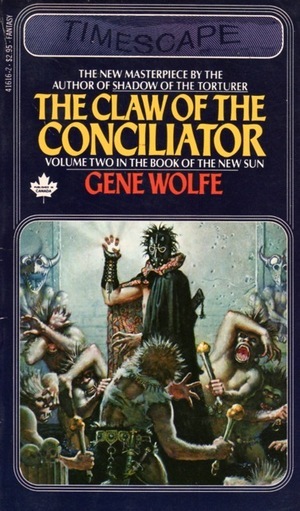 Having set out to discuss The Claw of the Concilator (1981), the second entry in Gene Wolfe’s Book of the New Sun, I’m completely unsure of what to write. Oh, I can tell you what happened, even how some things happened, but I’m not sure I can tell you why a lot of things happened. It’s probably due to a lack of context as two books remain in the series, but I’m not totally sure about that. Much of the story is conveyed via weird encounters, dreams, memories, fables, and even the text of a play. It’s challenging to piece the parts together to form a linear narrative, let alone anticipate the tale’s direction, which remains nearly as mysterious at the conclusion as at the start. At the end of the previous book, The Shadow of the Torturer, Severian and his companions were caught in a violent outburst among the crowd of people at the great gate exiting the city Nessus. Severian is now accompanied by Jonas, a man with “a jointed contrivance of steel” for a right hand. The others he traveled with, Dr. Talos, Baldanders, Jolenta, and Dorcas, were lost to him in the chaos. While intent on reaching Thrax to take up his assignment as the town’s executioner, Severian and Jonas still hope to find the others. Severian makes his way serving as itinerant headsman and torturer in several towns along the road. It is in the mining town of Saltus (its mine is the buried ruins of an ancient city) that we find Severian and Jonas as Claw opens. After he carries out a pair of executions, Severian is lured into danger by Agia. Previously she had colluded in setting him up to be killed and robbed, resulting in her own brother’s execution. She had also stolen the powerful artifact, the Claw of the Conciliator, and hidden it on Severian. Having discovered it, he has begun to realize it can emit a powerful light, heal wounds, and even raise the dead. With it, he is able to survive and overcome the trap set for him. Unfortunately it can’t keep him from falling into the hands of the rebel leader, Vodalus. This encounter leads to Severian and Jonas signing on with the rebels and being sent to the House Absolute, the secret palace of the Autarch. There he must deliver a message to another agent of the uprising. They will also find their friends there who have been hired to put on a play. Along the way things get extra weird. By book’s end, Severian has still not reached Thrax. He has, though, explored the House Absolute, one of the coolest works of fantastical architecture. It is covered with lawns and gardens to keep it from be spied from the sky. Miles and miles of tunnels lie below it, some, perhaps, even reaching all the way back to Nessus. Even more mysterious than the secret passages and rooms that seem de rigueur for any self-respecting palace, is the Second House. Instead of just adding more hidden chambers, the Autarch’s mysterious aide, Father Inrie, added an entire new house within the very structure of the House Absolute. Here I pause. If you wish to walk no farther with me, reader, I do not blame you. It is no easy road. I’m still puzzling over what to make of Claw. As a weird and bewitching creative work, it, even more than Shadow, is fantastic. There are numerous sequences in the book that have become indelibly etched in my brain. 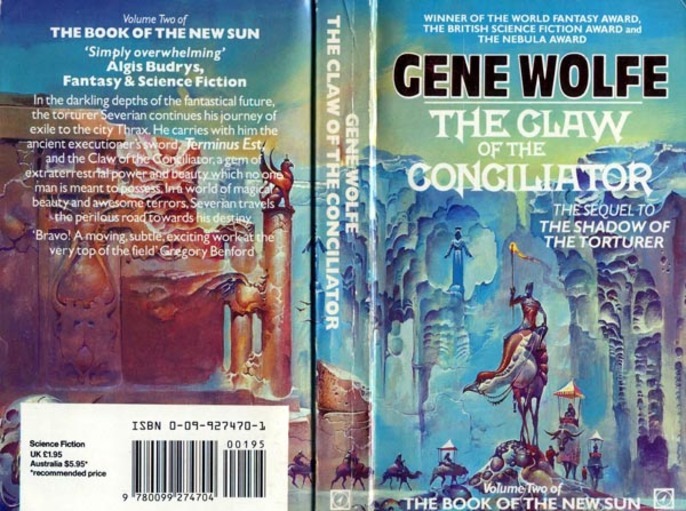 Among them is the one depicted on the Timescape cover (above) where Severian reveals the Claw to an attacking horde of ape-men in a subterranean ruin. I began to back away. The man-apes looked up at that, and their faces were the faces of human beings. When I saw them thus, I knew of the eons of struggles in the dark from which their fangs and saucer eyes and flap ears had come to be. We, so the mages say, were apes once, happy apes in forests swallowed by deserts so long ago they have no names. Old men return to childish ways when at last the years becloud their minds. May it not be that mankind will return (as an old man does) to the decayed image of what once was, if at last the old sun dies and we are left scuffling over bones in the dark? I saw our future — one future at least — and I felt more sorrow for those who had triumphed in the dark battles than for those who had poured out their blood in that endless night. Another is the “Tale of the Student and His Son.” While imprisoned in the House Absolute with generations of families born there, Severian passes the time reading the story. On its own — fairy tale of hero setting out to defeat monster and recover the women he’s taken in tribute over the years — it’s very good. When you realize that it’s a mashup of Theseus and the Minotaur and the battle of the Monitor and the Merrimac, it pops a couple of circuits in your head. The performance of the play, much of it comprised of nigh-impenetrable symbols, ending in the giant Baldanders’ mad assault on the audience to expose the disguised aliens in its midst isn’t easily forgotten either. Nonetheless, there’s lots going on in the book that is just downright confusing. Part of it is clearly due to Severian’s ignorance in the moment. As much as the reader, he doesn’t have a clue to what’s going on. Of course, from the perspective of Severian the storyteller, someone looking back on all the novel’s events, he should be able to clear it all up. Instead he leaves out important information which, when revealed, recontextualizes the story he’s telling. Several times while reading Claw I practically yelled out loud as some heretofore unrevealed thing was, well, revealed. When the entire quartet has been read all the pieces should fit into place and their secrets illuminated. In the meantime, Wolfe seems to be forcing his reader to experience the dislocation and loss of balance suffered by Severian. Like the young torturer, the reader is lead by the nose, from one mad event to another, never given time to catch his breath. At first it is definitely frustrating, but as the story unrolls, it becomes less so and a surreal dream logic takes control. That Wolfe is clearly a master at his game, with no words chosen without clear forethought, I have great hope for how things will play out. The complexity and complicated nature of Wolfe’s storytelling is not the result of haphazardness but that of meticulousness. That such control doesn’t read dry and too-mannered is a testimony to Wolfe’s power as a writer of great talent. The Claw of the Conciliator at times is like being dropped into someone else’s dream. The markers and symbols have meanings that are personal and inscrutable to anyone but the dreamer. It’s a strange, discombobulating feeling. 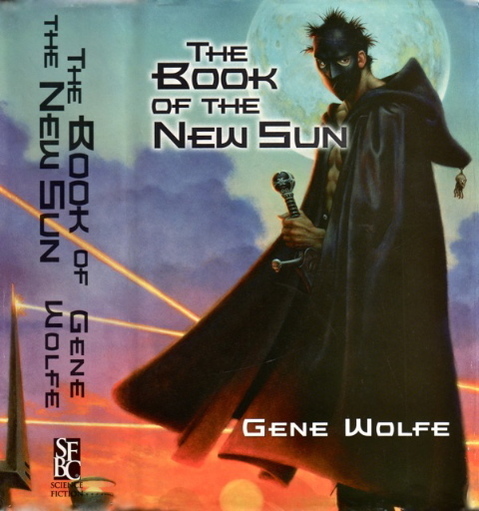 However, Wolfe drops far more than hints at what all these things signify, and one can see shapes beginning to coalesce out of the mist by the last pages. A great struggle is being fought for Urth and the possibility of its salvation. How that is to come about and what role Severian will play in it remains mysterious, but I’m hopeful the next book, The Sword of the Lictor, will divulge even more answers. When you win a hand of poker, you’re not obliged to turn over all of your cards. In the Book of the New Sun some things will come clear but some won’t. Wolfe never does turn over all of his cards, and I’m inclined to think that’s a virtue rather than a fault; it’s just like life. I think one difference, for me, at least, is that I’ve never tried to stop and make an assessment after finishing just one book — when I’ve read them, it’s always been as one big, continuous gulp. @Thomas – Agreed. I think I’m essentially saying that by the end, but you say it much more succinctly. @Joe H. – Of course that’s a problem reviewing a series that I’ve never read before. I knew what was happening in the Black Company. Here, like any first time reader, I’ve been tossed far off into the deep end by Wolfe and as much as I love it, it’s still a bit of struggle to learn how to swim. Fletcher — Don’t get me wrong — I’m finding it fascinating to see your reactions at the end of each volume, and I’m of course very much looking forward to seeing what you think of the completed series. Wolfe doesn’t really cut you a lot of slack as a reader — I just reread his story “The Detective of Dreams” and only now, after reading it several times in the past, did I finally catch the ending. I re-read the series a few years ago. I think the books are fairly representative of their time, being characterised by a certain dream logic, as opposed to being tightly plotted – not necessarily a bad thing, I hasten to add. I came across a great little story by Wolfe a few years ago. I’m guessing it was a sort of allegory? Imagine a sea. Then imagine that the waves rise and fall with glacial slowness. Then imagine a city perched on top of one particular wave. They can see another city in the trough of the wave. They know they are going to crash down on this city eventually, albeit not for many years. What do they do? The idea might sound preposterous, but Wolfe treats it with absolute seriousness. And the city is indistinguishable in many respects from a modern city – they first thing they do is hold a council meeting – heightening the story’s surreal qualities. If anybody knows what this story is actually called….. The story – should anybody be interested – was ‘Comber’. I came across it in a 2006 anthology edited by Rich Horton, no less.